Dirty Rat is back, but not as consistent. A new Hearthstone card for the upcoming expansion Rise of Shadows has been revealed by news website PCGamesN. Hecklebot is a neutral Rare Mech with a four-mana cost and 3/8 stats. It has Taunt and a Battlecry that makes your opponent summon a minion from their deck. Hecklebot’s stats are great for a four-mana minion. Having an eight-health body on the board on turn four is a threat, especially if you’re running a Mech deck with Magnetic cards. Its Battlecry may sound quite bad at first, and it really is if your opponent is running a deck with big minions and you summon for them a 12/12 Deathwing on turn four. 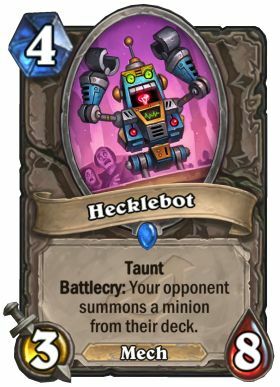 But in mid and late-game, when the player who uses Hecklebot has removal in hand, the Mech can be a great tool to eliminate a strong minion instantly or just to force your opponent to waste a strong Battlecry. To some extent, Hecklebot may remind players of Dirty Rat, which forced the opponent to summon a random minion from their hand. Its effect completely ruined some combo decks by forcing them to use a card way before they needed. Hecklebot might not be as consistent since there are many more minions in an opponent’s average deck than in their average hand, but it might be useful against some combo archetypes. Rise of Shadows will release in April 9, when players will be able to craft or open Hecklebot from packs. Those who want to guarantee a good price on card packs for the new expansion can buy bundles of 50 or 80 in pre-sale right now for $49.99 and $79.99, respectively. Players will be able to open their packs as soon as the expansion releases.